Engineers at the University of Wisconsin-Madison are shining a light on promising new strategies for storing solar power. The efforts could help overcome one major limitation of energy generation from solar sources—namely, how to keep up with electricity demand when the sun goes down. "As renewable energy takes on a larger role in our power grid, storage and on-demand delivery are critical," says Thatcher Root, a professor in the Department of Chemical and Biological Engineering. Renewable sources accounted for almost one quarter of the world's electricity generation in 2017, and solar power capacity has been growing at an annual rate of roughly 51 percent for the past decade. Unfortunately, consumer demand for electricity typically peaks in the evening, whereas solar energy generation is most efficient when the sun is high in the sky during midday. That mismatch is why solar power plants need better systems to store solar energy—ideally something cost-effective and efficient. Integrating heat storage into the collection-generation system can be better than adding batteries or other, separate storage systems. This approach can be especially useful for a renewable energy technology known as concentrating solar power (CSP), which is currently in use at almost 20 facilities in the United States. The plants collect heat from sunlight during the day and harness that energy to generate steam to power a turbine for electricity generation. With some care, the solar energy collected during the day can be stored as thermochemical energy—stored in chemical bonds—for nighttime use. Root and graduate student Elise Gilcher, who is coadvised by James Dumesic, the Ernest Micek Distinguished Chair in chemical and biological engineering, are tackling the storage problem by developing better catalysts—materials that speed up chemical reactions without becoming consumed and transformed into new products. The work will also be guided by Milton J. and A. Maude Shoemaker and Beckwith-Bascom Professor Thomas Keuch another faculty member within the department of Chemical and Biological Engineering who is world-renowned for contributions to catalysis research. Some of the newest CSP plants use molten salt to store energy, but UW-Madison engineers have identified more efficient methods. One promising option could be using a reversible methane reforming system, as described in a paper published April 13, 2017, in the journal Green Chemistry. Its authors include Xinyue Peng (a graduate student in Root's lab), Root, and Vilas Distinguished Achievement Professor and Paul A. Elfers Professor of Chemical and Biological Engineering Christos Maravelias. Methane thermochemical energy storage hinges on catalysts to assist the reactions used to store and release heat, and existing systems have one major problem. Over time, carbon build up on the surfaces of catalysts (a process called "coking"), rendering them useless. "We need catalysts that don't coke up," says Root. To tackle the problem, is working to chemically modify catalysts by applying a special anti-coking coating to the supported metal catalysts using a process called atomic layer deposition. The effort draws inspiration from earlier research spearheaded by Keuch and Dumesic, which showed that atomic layer deposition is suitable for catalysts in biofuels applications. 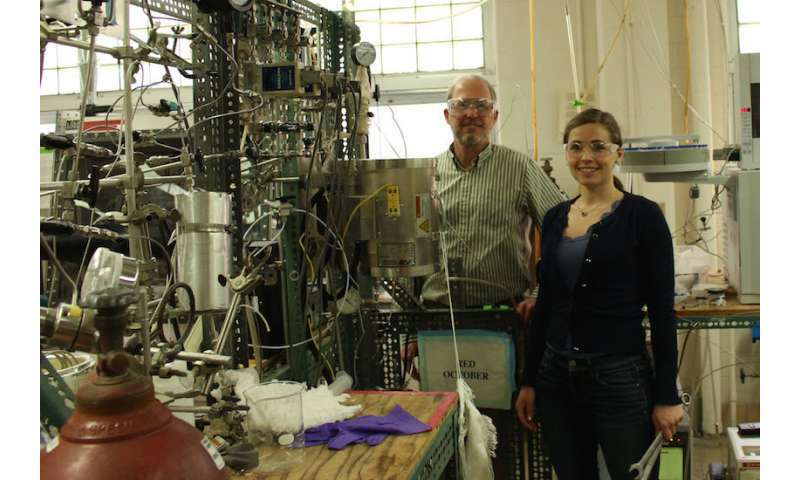 Gilcher will modify the procedures for different catalysts that are more commonly used in methane reforming plants.